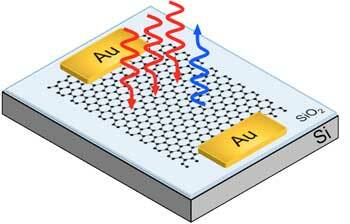 (Nanowerk News) Graphene, among other materials, can capture photons, combine them, and produce a more powerful optical beam. This is due to a physical phenomenon called the optical harmonic generation, which is characteristic of nonlinear materials. Nonlinear optical effects can be exploited in a variety of applications, including laser technology, material processing and telecommunications. Although all materials should present this behaviour, the efficiency of this process is typically small and cannot be controlled externally. Now, partners of the Graphene Flagship project in Cambridge (UK), Milan, and Genova (Italy) have demonstrated for the first time that graphene not only shows a good optical response, but also how to control the strength of this effect using an electric field (Nature Nanotechnology, "Broadband, electrically tuneable, third harmonic generation in graphene").